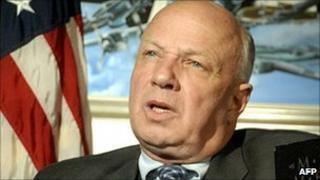 Police are investigating the death of a former US government official after his body was found at a dump in Delaware. The body of John Wheeler, 66, was discovered on Friday as a rubbish truck emptied its load at the state's Cherry Island landfill site. Mr Wheeler, a military veteran, served in the administrations of ex-Presidents George Bush Senior and Ronald Reagan. He was reportedly last seen on a train from Washington to Delaware on Tuesday. Investigators said he was killed. Mr Wheeler, himself a Vietnam veteran, was involved in fundraising efforts for the Vietnam War memorial on the capital's National Mall, as chairman of the Vietnam Veterans Memorial Fund. "He was just not the sort of person who would wind up in a landfill," Bayard Marin, a lawyer who was representing Mr Wheeler in a property dispute, told the Associated Press.